Ethylenethiourea focuses on the occurrence of ethylenethiourea (ETU) as a terminal residue resulting from agricultural use of ethylenebisdithiocarbamate (EBDC) fungicides. The book first states that EBDC forms the most essential class of fungicides for controlling diseases of agricultural crops. The class includes mancozeb, maneb, nabam, metiram, and zineb. The text also underscores that findings have shown that ETU may occur in plant samples after the use of dithiocarbamate fungicides. Methodologies used in the experiments include thin-layer chromatography, polarography, and radioisotope. 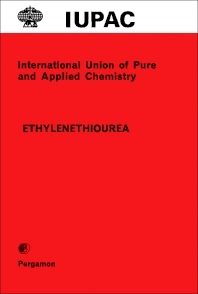 The publication offers information on the chemistry of ETU, including formation; transformation products of ETU; photooxidation; and soil, plant, and animal metabolism. The book also reviews the dynamics and transformation of ETU residues and the processing and cooking effects of EBDC’s. The book is a dependable reference for readers interested in the composition, reactions, effects, and transformations of EBDC fungicides.